Teams led by David Reich at Harvard Medical School and Eske Willerslev at the University of Copenhagen in Denmark announced, independently, that occupants of Corded Ware graves in Germany could trace about three-quarters of their genetic ancestry to the Yamnaya. It seemed that Corded Ware people weren’t simply copying the Yamnaya; to a large degree they actually were Yamnayan in origin. Burial practices shifted dramatically, a warrior class appeared, and there seems to have been a sharp upsurge in lethal violence. “I’ve become increasingly convinced there must have been a kind of genocide,” says Kristian Kristiansen at the University of Gothenburg, Sweden. 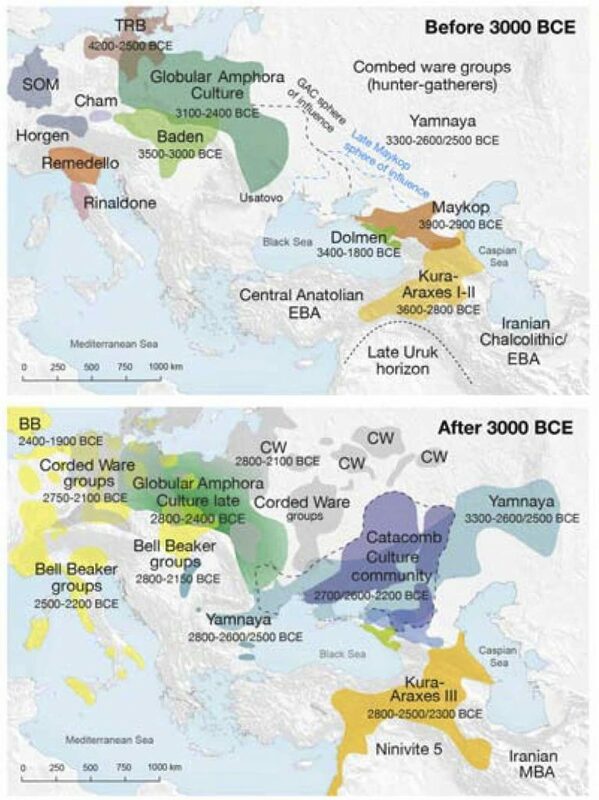 The collaboration revealed that the origin and initial spread of Bell Beaker culture had little to do – at least genetically – with the expansion of the Yamnaya or Corded Ware people into central Europe. “It started in It is in that region that the earliest Bell Beaker objects – including arrowheads, copper daggers and distinctive Bell-shaped pots – have been found, in archaeological sites carbon-dated to 4700 years ago. Then, Bell Beaker culture began to spread east, although the people more or less stayed put. By about 4600 years ago, it reached the most westerly Corded Ware people around where the Netherlands now lies. For reasons still unclear, the Corded Ware people fully embraced it. “They simply take on part of the Bell Beaker package and become Beaker people,” says Kristiansen. The fact that the genetic analysis showed the Britons then all-but disappeared within a couple of generations might be significant. 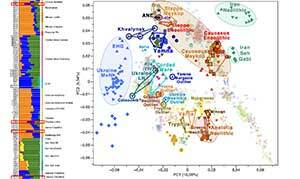 It suggests the capacity for violence that emerged when the Yamnaya lived on the Eurasia steppe remained even as these people moved into Europe, switched identity from Yamnaya to Corded Ware, and then switched again from Corded Ware to Bell Beaker. Notice what Kristiansen did there? Yamnaya men “switched identities” into Corded Ware, then “switched identities” into Bell Beakers…So, the most aggresive peoples who have ever existed, exterminating all other Europeans, were actually not so violent when embracing wholly different cultures whose main connection is that they built kurgans (yes, Gimbutas lives on). In fact, there is much stronger evidence that these Yamnaya Beakers were ruthless. By about 4500 years ago, they had pushed westwards into the Iberian Peninsula, where the Bell Beaker culture originated a few centuries earlier. Within a few generations, about 40 per cent of the DNA of people in the region could be traced back to the incoming Yamnaya Beakers, according to research by a large team including Reich that was published this month. More strikingly, the ancient DNA analysis reveals that essentially all the men have Y chromosomes characteristic of the Yamnaya, suggesting only Yamnaya men had children. “The collision of these two populations was not a friendly one, not an equal one, but one where the males from outside were displacing local males and did so almost completely,” Reich told New Scientist Live in September. This supports Kristiansen’s view of the Yamnaya and their descendants as an almost unimaginably violent people. Indeed, he is about to publish a paper in which he argues that they were responsible for the genocide of Neolithic Europe’s men. “It’s the only way to explain that no male Neolithic lines survived,” he says. So these unimaginably violent Yamnaya men had children exclusively with their Y chromosomes…but not Dutch Single Grave peoples. These great great steppe-like northerners switched culture, cephalic index…and Y-chromosome from R1a (and others) to R1b-L151 to expand Italo-Celtic From The West™. It’s hilarious how (exactly like their latest funny episode of PIE from south of the Caucasus) this new visionary idea copied by Copenhagen from amateur friends (or was it the other way around?) had been already rejected before this article came out, in Olalde et al. (2019), and that “Corded Ware=Indo-European” fans have become a parody of themselves. What’s not to love about 2019 with all this back-and-forth hopping between old and new pet theories? NOTE. I would complain (again) that the obsessive idea of the Danes is that Denmark CWC is (surprise!) the Pre-Germanic community, so it has nothing to do with “steppe ancestry = Indo-European” (or even with “Corded Ware = Indo-European”, for that matter), but then again you have Koch still arguing for Celtic from the West, Kortlandt still arguing for Balto-Slavic from the east, and – no doubt worst of all – “R1a=IE / R1b=Vasconic / N1c=Uralic” ethnonationalists arguing for whatever is necessary right now, in spite of genetic research. A striking example of this distinction is a discovery made near the town of Valencina de la Concepción in southern Spain. Archaeologists working there found a Yamnaya-like kurgan, below which was the body of a man buried with a dagger and Yamnaya-like sandals, and decorated with red pigment just as Yamnaya dead were. But the burial is 4875 years old and genetic information suggests Yamnaya-related people didn’t reach that far west until perhaps 4500 years ago. “Genetically, I’m pretty sure this burial has nothing to do with the Yamnaya or the Corded Ware,” says Heyd. “But culturally – identity-wise – there is an aspect that can be clearly linked with them.” It would appear that the ideology, lifestyle and death rituals of the Yamnaya could sometimes run far ahead of the migrants. NOTE. I have been trying to find which kurgan is this, reviewing this text on the archaeological site, but didn’t find anything beyond occasional ochre and votive sandals, which are usual. Does some reader know which one is it? 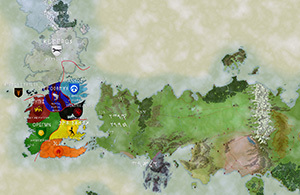 Yamna expansion and succeeding East Bell Beaker expansion, without color on Bell Beaker territories. Notice vanguard Yamna groups in blue where East Bell Beakers later emerge. 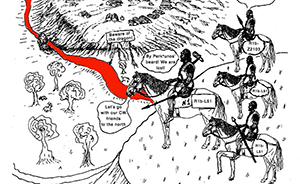 See original image with Bell Beaker territories. 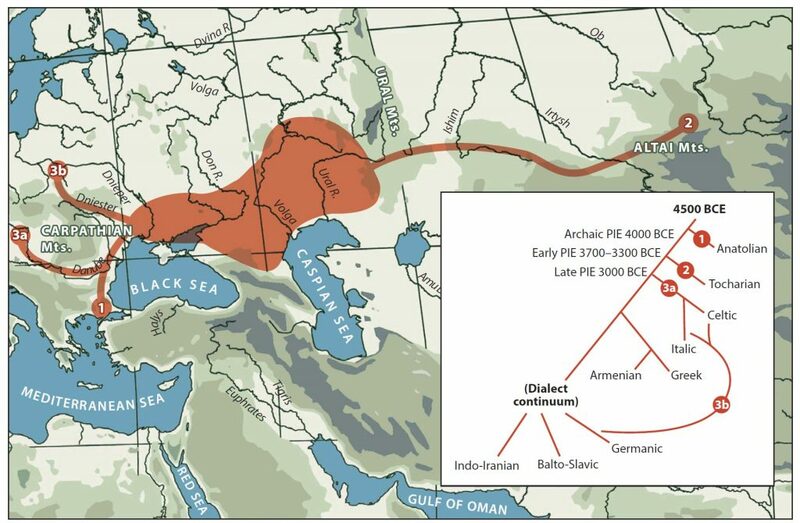 It doesn’t seem like Proto-Beaker and Yamna just “crossed paths” at some precise time around the Lower Danube, and Yamna men “switched cultures”. 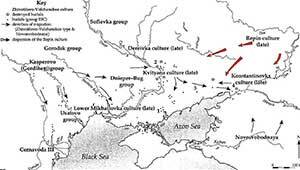 It seems that many Yamna vanguard groups, probably still in long-distance contact with Yamna settlers from the Carpathian Basin, were already settled in different European regions in the first half of the 3rd millennium BC, before the explosive expansion of East Bell Beakers ca. 2500 BC. As Heyd says, there are potentially many Yamna settlements along the Middle and Lower Danube and tributaries not yet found, connecting the Carpathian Basin to Western and Northern Europe. These vanguard groups would have more easily transformed their weakened eastern Yamna connections with the fashionable Proto-Beaker package expanding from the west (and surrounding all of these loosely connected settlements), just like the Yamna materials from Seville probably represent a close cultural contact of Chalcolithic Iberia with a Yamna settlement (the closest known site with Yamna traits is near Alsace, where high Yamna ancestry is probably going to be found in a Bell Beaker R1b-L151 individual). 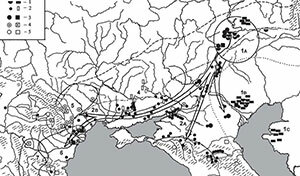 This does not mean that there wasn’t a secondary full-scale migration from the Carpathian Basin and nearby settlements, just like Corded Ware shows a secondary (A-horizon?) migration to the east with R1a-Z645. It just means that there was a complex picture of contacts between Yamna and European Chalcolithic groups before the expansion of Bell Beakers. Doesn’t seem genocidal enough for a popular movie, tho. Open access A tutorial on how not to over-interpret STRUCTURE and ADMIXTURE bar plots, by Daniel J. Lawson, Lucy van Dorp & Daniel Falush, Nature Communications (2018). 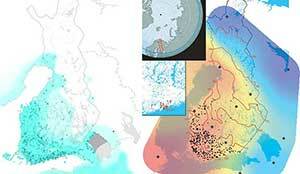 Experienced researchers, particularly those interested in population structure and historical inference, typically present STRUCTURE results alongside other methods that make different modelling assumptions. These include TreeMix, ADMIXTUREGRAPH, fineSTRUCTURE, GLOBETROTTER, f3 and D statistics, amongst many others. These models can be used both to probe whether assumptions of the model are likely to hold and to validate specific features of the results. Each also comes with its own pitfalls and difficulties of interpretation. It is not obvious that any single approach represents a direct replacement as a data summary tool. 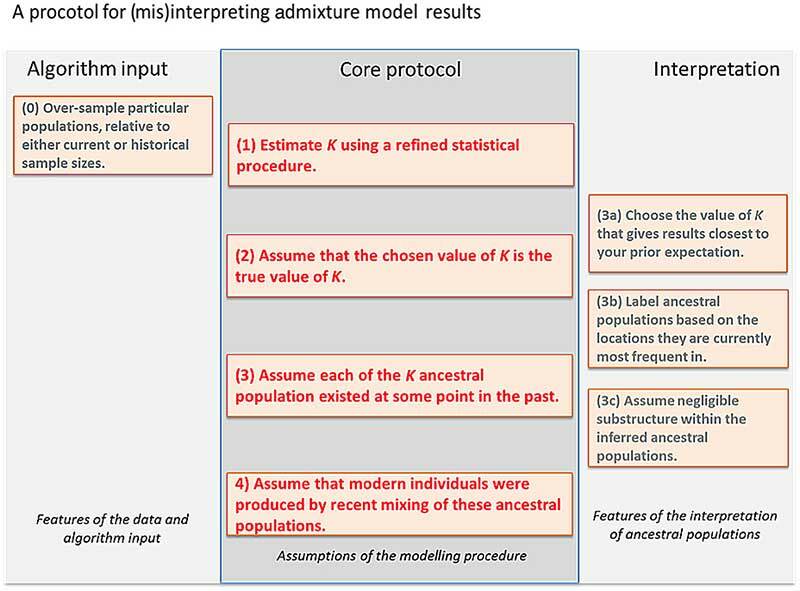 Here we build more directly on the results of STRUCTURE/ADMIXTURE by developing a new approach, badMIXTURE, to examine which features of the data are poorly fit by the model. Rather than intending to replace more specific or sophisticated analyses, we hope to encourage their use by making the limitations of the initial analysis clearer. Most researchers are cautious but literal in their interpretation of STRUCTURE and ADMIXTURE results, as caricatured in Fig. 1, as it is difficult to interpret the results at all without making several of these assumptions. Here we use simulated and real data to illustrate how following this protocol can lead to inference of false histories, and how badMIXTURE can be used to examine model fit and avoid common pitfalls. STRUCTURE and ADMIXTURE are popular because they give the user a broad-brush view of variation in genetic data, while allowing the possibility of zooming down on details about specific individuals or labelled groups. Unfortunately it is rarely the case that sampled data follows a simple history comprising a differentiation phase followed by a mixture phase, as assumed in an ADMIXTURE model and highlighted by case study 1. Naïve inferences based on this model (the Protocol of Fig. 1) can be misleading if sampling strategy or the inferred value of the number of populations K is inappropriate, or if recent bottlenecks or unobserved ancient structure appear in the data. It is therefore useful when interpreting the results obtained from real data to think of STRUCTURE and ADMIXTURE as algorithms that parsimoniously explain variation between individuals rather than as parametric models of divergence and admixture. For example, if admixture events or genetic drift affect all members of the sample equally, then there is no variation between individuals for the model to explain. Non-African humans have a few percent Neanderthal ancestry, but this is invisible to STRUCTURE or ADMIXTURE since it does not result in differences in ancestry profiles between individuals. The same reasoning helps to explain why for most data sets—even in species such as humans where mixing is commonplace—each of the K populations is inferred by STRUCTURE/ADMIXTURE to have non-admixed representatives in the sample. If every individual in a group is in fact admixed, then (with some exceptions) the model simply shifts the allele frequencies of the inferred ancestral population to reflect the fraction of admixture that is shared by all individuals. Several methods have been developed to estimate K, but for real data, the assumption that there is a true value is always incorrect; the question rather being whether the model is a good enough approximation to be practically useful. First, there may be close relatives in the sample which violates model assumptions. Second, there might be “isolation by distance”, meaning that there are no discrete populations at all. Third, population structure may be hierarchical, with subtle subdivisions nested within diverged groups. This kind of structure can be hard for the algorithms to detect and can lead to underestimation of K. Fourth, population structure may be fluid between historical epochs, with multiple events and structures leaving signals in the data. Many users examine the results of multiple K simultaneously but this makes interpretation more complex, especially because it makes it easier for users to find support for preconceptions about the data somewhere in the results. In practice, the best that can be expected is that the algorithms choose the smallest number of ancestral populations that can explain the most salient variation in the data. Unless the demographic history of the sample is particularly simple, the value of K inferred according to any statistically sensible criterion is likely to be smaller than the number of distinct drift events that have practically impacted the sample. The algorithm uses variation in admixture proportions between individuals to approximately mimic the effect of more than K distinct drift events without estimating ancestral populations corresponding to each one. In other words, an admixture model is almost always “wrong” (Assumption 2 of the Core protocol, Fig. 1) and should not be interpreted without examining whether this lack of fit matters for a given question. Three scenarios that give indistinguishable ADMIXTURE results. a Simplified schematic of each simulation scenario. b Inferred ADMIXTURE plots at K= 11. c CHROMOPAINTER inferred painting palettes. Because STRUCTURE/ADMIXTURE accounts for the most salient variation, results are greatly affected by sample size in common with other methods. Specifically, groups that contain fewer samples or have undergone little population-specific drift of their own are likely to be fit as mixes of multiple drifted groups, rather than assigned to their own ancestral population. Indeed, if an ancient sample is put into a data set of modern individuals, the ancient sample is typically represented as an admixture of the modern populations (e.g., ref. 28,29), which can happen even if the individual sample is older than the split date of the modern populations and thus cannot be admixed. This paper was already available as a preprint in bioRxiv (first published in 2016) and it is incredible that it needed to wait all this time to be published. I found it weird how reviewers focused on the “tone” of the paper. I think it is great to see files from the peer review process published, but we need to know who these reviewers were, to understand their whiny remarks… A lot of geneticists out there need to develop a thick skin, or else we are going to see more and more delays based on a perceived incorrect tone towards the field, which seems a rather subjective reason to force researchers to correct a paper. Open access Effective principal components analysis of SNP data, by Gauch, Qian, Piepho, Zhou, & Chen, bioRxiv (2018). A potential hindrance to our advice to upgrade from PCA graphs to PCA biplots is that the SNPs are often so numerous that they would obscure the Items if both were graphed together. 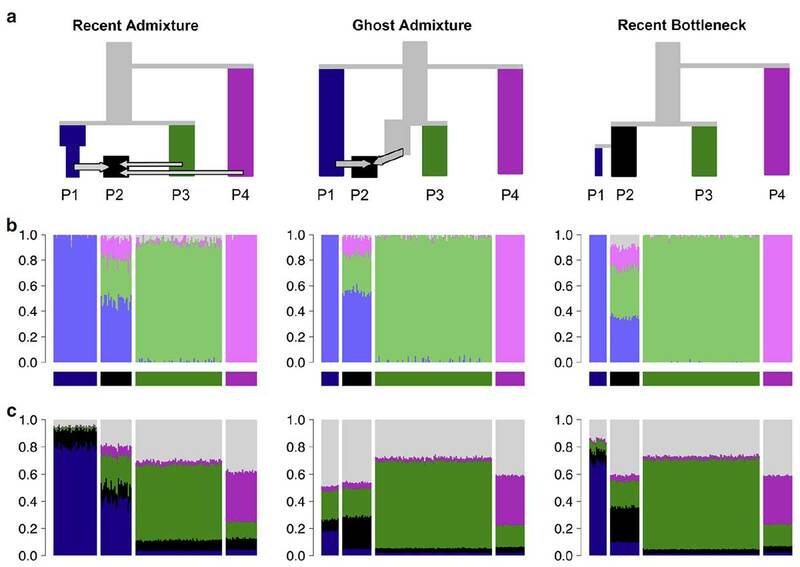 One way to reduce clutter, which is used in several figures in this article, is to present a biplot in two side-by-side panels, one for Items and one for SNPs. Another stratagem is to focus on a manageable subset of SNPs of particular interest and show only them in a biplot in order to avoid obscuring the Items. A later section on causal exploration by current methods mentions several procedures for identifying particularly relevant SNPs. One of several data transformations is ordinarily applied to SNP data prior to PCA computations, such as centering by SNPs. These transformations make a huge difference in the appearance of PCA graphs or biplots. A SNPs-by-Items data matrix constitutes a two-way factorial design, so analysis of variance (ANOVA) recognizes three sources of variation: SNP main effects, Item main effects, and SNP-by-Item (S×I) interaction effects. Double-Centered PCA (DC-PCA) removes both main effects in order to focus on the remaining S×I interaction effects. The resulting PCs are called interaction principal components (IPCs), and are denoted by IPC1, IPC2, and so on. By way of preview, a later section on PCA variants argues that DC-PCA is best for SNP data. Surprisingly, our literature survey did not encounter even a single analysis identified as DC-PCA. The axes in PCA graphs or biplots are often scaled to obtain a convenient shape, but actually the axes should have the same scale for many reasons emphasized recently by Malik and Piepho . However, our literature survey found a correct ratio of 1 in only 10% of the articles, a slightly faulty ratio of the larger scale over the shorter scale within 1.1 in 12%, and a substantially faulty ratio above 2 in 16% with the worst cases being ratios of 31 and 44. Especially when the scale along one PCA axis is stretched by a factor of 2 or more relative to the other axis, the relationships among various points or clusters of points are distorted and easily misinterpreted. Also, 7% of the articles failed to show the scale on one or both PCA axes, which leaves readers with an impressionistic graph that cannot be reproduced without effort. The contemporary literature on PCA of SNP data mostly violates the prohibition against stretching axes. DC-PCA biplot for oat data. The gradient in the CA-arranged matrix in Fig 13 is shown here for both lines and SNPs by the color scheme red, pink, black, light green, dark green. The percentage of variation captured by each PC is often included in the axis labels of PCA graphs or biplots. In general this information is worth including, but there are two qualifications. First, these percentages need to be interpreted relative to the size of the data matrix because large datasets can capture a small percentage and yet still be effective. For example, for a large dataset with over 107,000 SNPs for over 6,000 persons, the first two components capture only 0.3693% and 0.117% of the variation, and yet the PCA graph shows clear structure (Fig 1A in ). Contrariwise, a PCA graph could capture a large percentage of the total variation, even 50% or more, but that would not guarantee that it will show evident structure in the data. Second, the interpretation of these percentages depends on exactly how the PCA analysis was conducted, as explained in a later section on PCA variants. Readers cannot meaningfully interpret the percentages of variation captured by PCA axes when authors fail to communicate which variant of PCA was used. Five simple recommendations for effective PCA analysis of SNP data emerge from this investigation. Use the SNP coding 1 for the rare or minor allele and 0 for the common or major allele. Use DC-PCA; for any other PCA variant, examine its augmented ANOVA table. Report which SNP coding and PCA variant were selected, as required by contemporary standards in science for transparency and reproducibility, so that readers can interpret PCA results properly and reproduce PCA analyses reliably. Produce PCA biplots of both Items and SNPs, rather than merely PCA graphs of only Items, in order to display the joint structure of Items and SNPs and thereby to facilitate causal explanations. Be aware of the arch distortion when interpreting PCA graphs or biplots. Produce PCA biplots and graphs that have the same scale on every axis. NOTE. This is related to a vertical distorsion (i.e. horizontal stretching), but possibly also to the addition of some distant outlier sample/s. Every time I read papers like these, I remember commenters who kept swearing that genetics was the ultimate science that would solve anthropological problems, where unscientific archaeology and linguistics could not. Well, it seems that, like radiocarbon analysis, these promising developing methods need still a lot of refinement to achieve something meaningful, and that they mean nothing without traditional linguistics and archaeology… But we already knew that. Also, if this is happening in most peer-reviewed publications, made by professional geneticists, in journals of high impact factor, you can only wonder how many more errors and misinterpretations can be found in the obscure market of so many amateur geneticists out there. Because amateur geneticist is a commonly used misnomer for people who are not geneticists (since they don’t have the most basic education in genetics), and some of them are not even ‘amateurs’ (because they are selling the outputs of bioinformatic tools)… It’s like calling healers ‘amateur doctors’. NOTE. While everyone involved in population genetics is interested in knowing the truth, and we all have our confirmation (and other kinds of) biases, for those who get paid to tell people what they want to hear, and who have sold lots of wrong interpretations already, the incentives of ‘being right’ – and thus getting involved in crooked and paranoid behaviour regarding different interpretations – are as strong as the money they can win or loose by promoting themselves and selling more ‘product’. As a reminder of how badly these wrong interpretations of genetic results – and the influence of the so-called ‘amateurs’ – can reflect on research groups, yet another turn of the screw by the Copenhagen group, in the oral presentations at Languages and migrations in pre-historic Europe (7-12 Aug 2018), organized by the Copenhagen University. 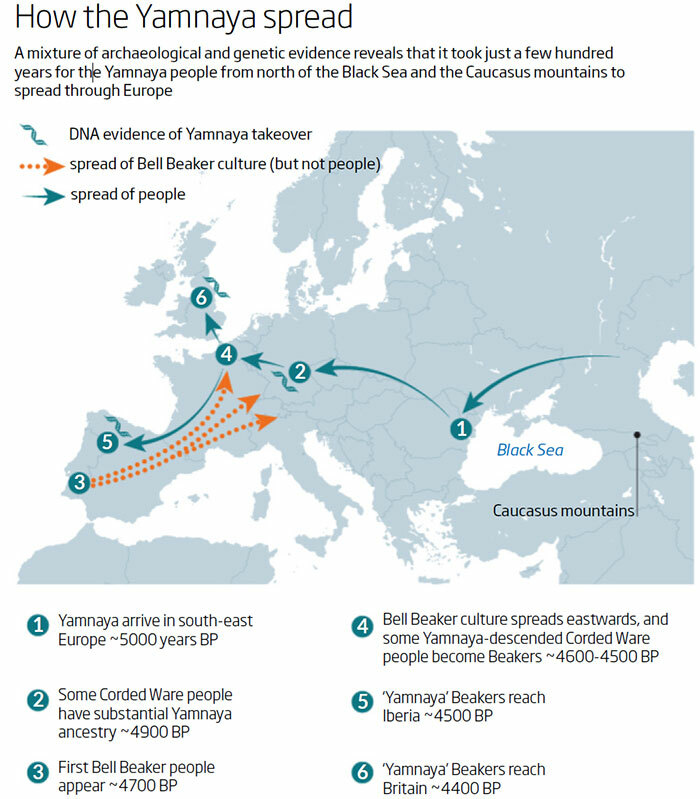 The common theme seems to be that Bell Beaker and thus R1b-L23 subclades do represent a direct expansion from Yamna now, as opposed to being derived from Corded Ware migrants, as they supported before. NOTE. Yes, the “Yamna → Corded Ware → Únětice / Bell Beaker” migration model is still commonplace in the Copenhagen workgroup. Yes, in 2018. Guus Kroonen had already admitted they were wrong, and it was already changed in the graphic representation accompanying a recent interview to Willerslev. However, since there is still no official retraction by anyone, it seems that each member has to reject the previous model in their own way, and at their own pace. I don’t think we can expect anyone at this point to accept responsibility for their wrong statements. 1st millennium BC expanded Gaulish with La Tène, including a “Gaulish version of Celtic to Ireland/UK” [hmmm, dat British Gaulish indeed]. You know, because, why the hell not? A logical, stable, consequential, no-nonsense approach to Indo-European migrations, as always. Nørtoft’s (2018) maps of Indo-European migrations. I really, really loved that perennial arrow of migration from Volosovo, ca. 4000-800 BC (3000+ years, no less! ), representing Uralic?, like that, without specifics – which is like saying, “somebody from the eastern forest zone, somehow, at some time, expanded something that was not Indo-European to Finland, and we couldn’t care less, except for the fact that they were certainly not R1a“. This and Kristiansen’s arrows are the most comical invented migration routes of 2018; and that is saying something, given the dozens of similar maps that people publish in forums and blogs each week. NOTE. You can read a more reasonable account of how haplogroup R1b-L51 and how R1-Z645 subclades expanded, and which dialects most likely expanded with them. We don’t know where these scholars of the Danish workgroup stand at this moment, or if they ever had (or intended to have) a common position – beyond their persistent ideas of Yamnaya™ ancestral component = Indo-European and R1a must be Indo-European – , because each new publication changes some essential aspects without expressly stating so, and makes thus everything still messier. It’s hard to accept that this is a series of presentations made by professional linguists, archaeologists, and geneticists, as stated by the official website, and still harder to imagine that they collaborate within the same professional workgroup, which includes experienced geneticists and academics. Recent open access paper The ring sanctuary of Pömmelte, Germany: a monumental, multi-layered metaphor of the late third millennium BC, by Spatzier and Bertemes, Antiquity (2018) 92(363):655-673. The main occupation began at 2321–2211 cal BC, with the stratigraphically earliest features containing exclusively Bell Beaker finds. Bell Beaker ceramics continue after 2204–2154 cal BC (boundary occupation I/II), although they were probably undecorated, but are now complemented by Únětice Culture (and other Early Bronze Age) types. At this time, with features common to both cultures predominate. Only contexts dating to the late main occupation phase (late phase II) and thereafter contained exclusively Únětice Culture finds. Evidently, the bearers of the Bell Beaker Culture were the original builders of the enclosure. 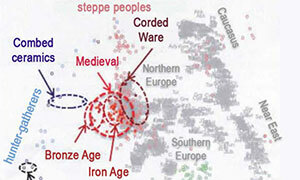 During a second phase of use, Final Neolithic and Early Bronze Age cultures coexisted and intermingled. 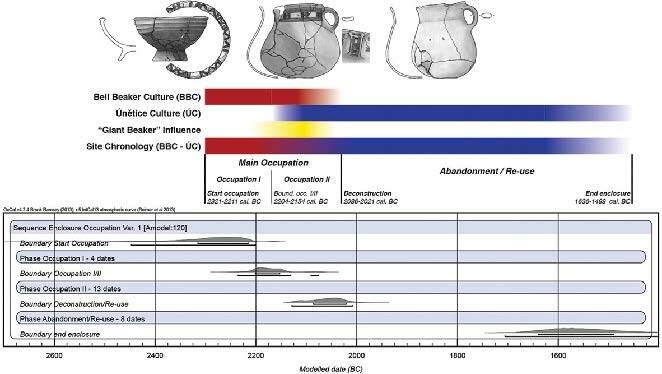 The material remains, however, should not be taken as evidence for successive groups of differing archaeological cultures, but as witnesses to a cultural transition from the Bell Beaker Culture to the Únětice Culture (Spatzier 2015). The main occupation ended 2086–2021 cal BC with the deconstruction of the enclosure; Bell Beaker finds are now absent. Finally, a few features (among them one shaft) and radiocarbon dates attest the sporadic re-use of the site in a phase of abandonment/re-use that ended 1636– 1488 cal BC. Cultural sequence and chronological model of the Pömmelte enclosure’s occupation (dates in 1σ-precision) (designed by André Spatzier). How the above-ground structures possibly influenced perception may reveal another layer of meaning that highlights social functions related to ritual. While zone I was disconnected from the surroundings by a ‘semi-translucent’ post-built border, zones II/III were separated from the outside world by a wooden wall (i.e. the palisade), and zone III probably separated individuals from the crowd gathered in zone II. Accessing the interior or centre therefore meant passing through transitional zones, to first be secluded and then segregated. Exiting the structure meant re-integration and re-connection. The experience possibly induced when entering and leaving the monument reflects the three stages of ‘rites of passage’ described by van Gennep (1909): separation, liminality and incorporation. 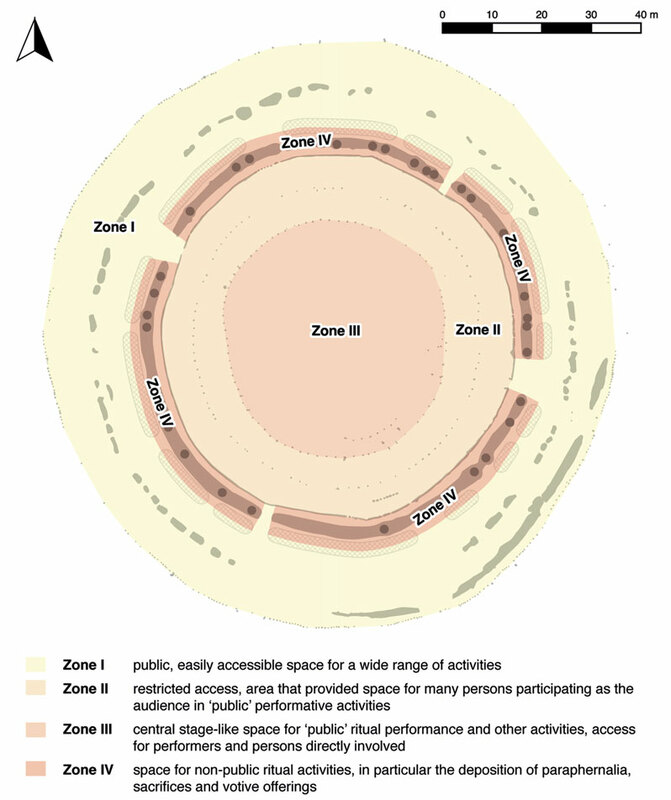 The enclosure’s outer zone(s) represents the pre- and post-liminal phase; the central area, the liminal phase. Seclusion and liminality in the interior promoted a sense of togetherness, which can be linked to Turner’s “communitas” (1969: 132–33). We might therefore see monuments such as the Pömmelte enclosure as important communal structures for social regulation and the formation of identity. Layers of meaning of the Pömmelte enclosure as deduced from the archaeological record (design by André Spatzier). (…) The long-term stability of these connotations must be emphasised. As with the tradition of making depositions, these meanings were valid from the start of the occupation — c. 2300 BC — until at least the early period following the deconstruction event, c. 2050 BC. While the spatial organisation and the solar alignment of the main entrances were maintained throughout the main occupation, stone axes and ‘formal’ graves indicate the continuation of the spatial concepts described above until the twentieth to nineteenth centuries BC. These layers of meaning mirror parallel concepts of space including, although not necessarily restricted to, the formation of group identities (see Hansen & Meyer 2013: 5). They can perhaps be better understood as a ‘cosmological geography’ manifested in the symbolism of superimposed levels of conceptual ideas related to space and to certain cardinal points (Figure 8). This idea is closely related to Eliade’s (1959: 29–36) understanding of “organized — hence comicized — territory”, that is territory consecrated to provide orientation within the homogeneity of the chaotic ‘outside world’, and the equivalence of spatial consecration and cosmogony. Put differently, the Pömmelte enclosure can be interpreted as a man-made metaphor and an icon of the cosmos, reflecting the Weltanschauung (a comprehensive conception of the world) of the people who built and used it. By bringing together Eliade and Rappaport’s ideas of meaningfulness in relation to religious experience (Rappaport 1999: 391–95), it may be argued that Pömmelte was a place intended to induce oneness with the cosmos. In combining multiple layers that symbolically represent different aspects of life (first-ordermeaning), the enclosure became an icon metaphorically representing the world (second-order-meaning). As this icon was the place to reaffirm life symbolism ritually, through their actions, people perhaps experienced a sense of rootedness in, or unity with, the cosmos (highest-order-meaning). Although we can only speculate about the perceptions of ancient people, such a theory aiming to describe general principles of religious experience can provide insight. The circular enclosure of Pömmelte is the first Central European monumental complex of primarily sacred importance that has been excavated and studied in detail. It reveals aspects of society and belief during the transition from the Final Neolithic to the Early Bronze Age, in the second half of the third millennium BC. 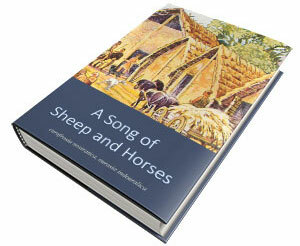 Furthermore, it offers details of ritual behaviour and the way that people organised their landscape. A sacred interior was separated from the profane environment, and served as a venue for rites that secured the continuity of the social, spiritual and cosmic order. Ancestor worship formed another integral part of this: a mound-covered burial hut and a square-shaped ditch sanctuary (located, respectively, within and near the enclosure’s south-eastern sector; cf. Figure 2)—dating to 2880–2580 cal BC and attributed to the Corded Ware Culture (Spatzier 2017a: 235–44)—suggest that this site was deliberately chosen. With construction of the ring sanctuary, this place gained an immense expansion in meaning—comparable to Stonehenge. Through architectural transformation, both of these sites developed into sanctuaries with increasingly complex religious functions, including in relation to the cult of the dead. The cosmological and social functions, and the powerful symbolism of the Nebra sky disc and hoard (Meller 2010: 59–70), are reflected in Pömmelte’s monumental architecture. All of these features—along with Pömmelte’s dating, function and complex ring structure—are well documented for British henge monuments (Harding 2003; Gibson 2005). The continuous use of circular enclosures in Central Europe from around 3000– 1500 BC remains to be confirmed, but strong evidence indicates usage spanning from the fifth to the first millennia BC (Spatzier 2017a: 273–96). From 2500 BC onwards, examples in Central Europe, Iberia and Bulgaria (Bertemes 2002; Escudero Carrillo et al. 2017) suggest a Europe-wide concept of sanctuary. This indicates that in extensive communication networks at the beginning of bronze metallurgy (Bertemes 2016), intellectual and religious contents circulated alongside raw materials. The henge monuments of the British Isles are generally considered to represent a uniquely British phenomenon, unrelated to Continental Europe; this position should now be reconsidered. The uniqueness of Stonehenge lies, strictly speaking, with its monumental megalithic architecture. Model of the spatial organisation of the Pömmelte enclosure (designed by André Spatzier). No serious scholar can argue at this point against the male-biased East Bell Beaker migrations that expanded the European languages related to Late Proto-Indo-European-speaking Yamna (see David Reich’s comments), and thus most likely North-West Indo-European – the ancestor of Italo-Celtic, Germanic, and Balto-Slavic, apart from Pre-Celtic IE in the British Isles, Lusitano-Galician in Iberia, or Messapic in Italy (see here a full account). With language, these migrants (several ten thousands) brought their particular Weltanschauung to all of Western, Central, and Northern Europe. 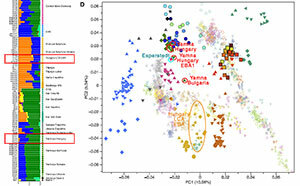 Their admixture precisely in Hungary shows that they had close interactions with non-Indo-European peoples (genetically related to the Globular Amphorae culture), something that we knew from the dozens of non-Indo-European words reconstructed exclusively for North-West Indo-European, apart from the few reconstructed non-Indo-European words that NWIE shares with Palaeo-Balkan languages, which point to earlier loans from their ancestors, Yamna settlers migrating along the lower Danube. It is not difficult to imagine that the initial East Bell Beaker group shared a newly developed common cosmological point of view that clashed with other neighbouring Yamna-related worldviews (e.g. in Balkan EBA cultures) after the cultural ties with Yamna were broken. Interesting in this respect is for example their developed (in mythology as in the new North-West Indo-European concept) *Perkwūnos, the weather god – probably remade (in language as in concept) from a Yamna minor god also behind Old Indian parjányas, the rain god – as one of the main gods from the new Pantheon, distinct from *Dyēus patēr, the almighty father sky god. In support of this, the word *meldh-n- ‘lightning’, behind the name of the mythological hammer of the weather god (cf. 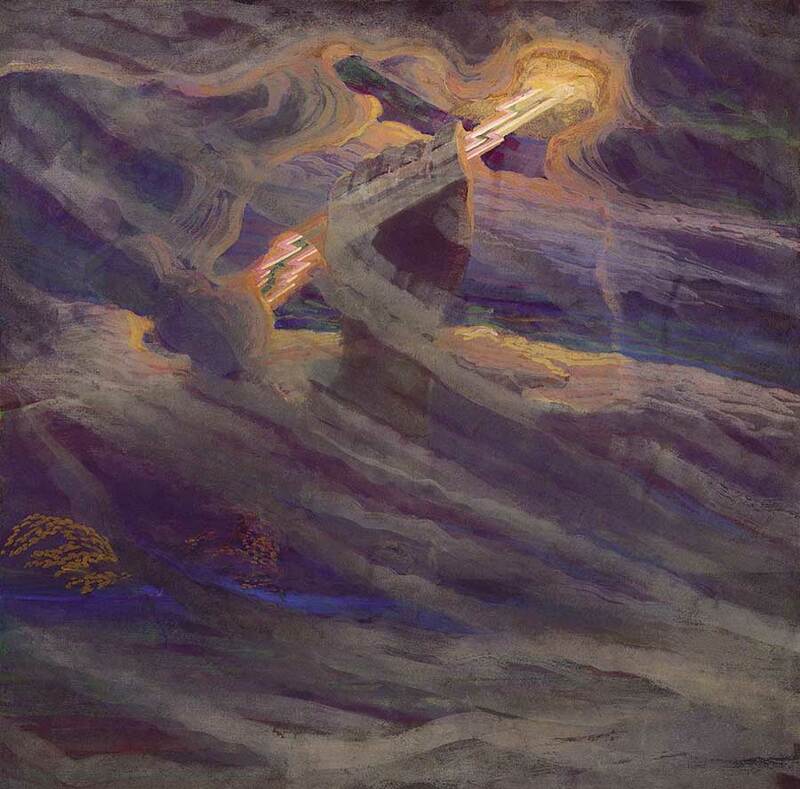 Old Norse Mjǫllnir or Latvian Milna), was also a newly coined North-West Indo-European term, although the myth of the hero slaying the dragon with the magical object is older. Circular enclosures are known in Europe since the Neolithic. Also, the site selected for the Pömmelte enclosure had been used to bury Corded Ware individuals some centuries before its construction, and Corded Ware symbolism (stone axe vs. quern) is seen in the use given by Bell Beakers and later Únětice at this place. All this and other regional similarities between Bell Beakers and different local cultures (see here an example of Iberian Bell Beakers) points to syncretism of the different Bell Beaker groups with preceding cultures in the occupied regions. After all, their genealogical ancestors included also those of their maternal side, and not all encountered males disappeared, as is clearly seen in the resurge of previous paternal lineages in Central-East Europe and in Scandinavia. 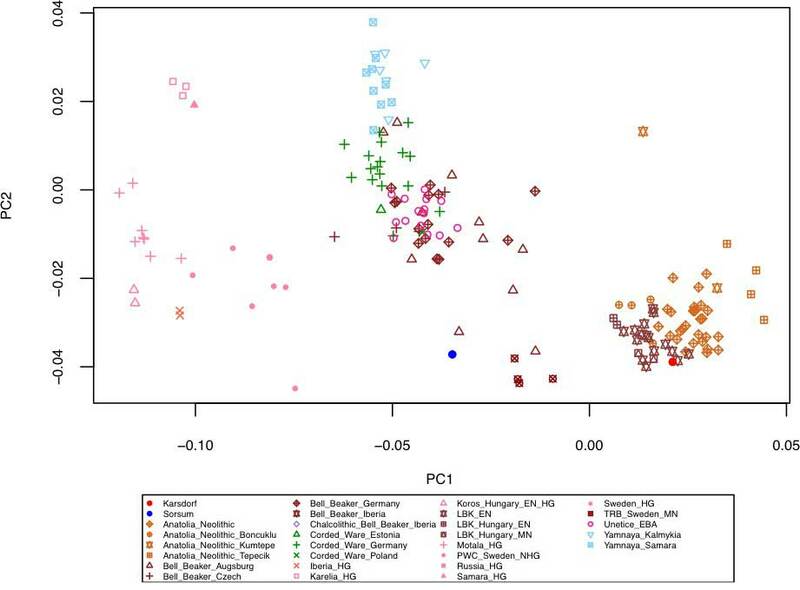 The admixture of Bell Beakers with previous groups (especially those of similar steppe-related ancestry from Corded Ware) needs more complex analyses to clarify potential early dialectal expansions (read what Iosif Lazaridis has to say). These syncretic trends gave rise to distinct regional cultures, and eventually different local groups rose to power in the new cultural regions and ousted the old structures. Social norms, hierarchy, and pantheons were remade. Events like this must have been repeated again and again in Bronze and Iron Age Europe, and in many cases it was marked by a difference in the prevailing archaeological culture attested, and probably accompanied by certain population replacements that will be seen with more samples and studies of fine-scale population structure. Some of these cultural changes, marked by evident haplogroup or admixture replacement, are defined as a ‘resurge’ of ancestry linked to previous populations, although that is obviously not equivalent to a resurge of a previous cultural group, because they usually represent just a successful local group of the same supraregional culture with a distinct admixture and/or haplogroup (see e.g. 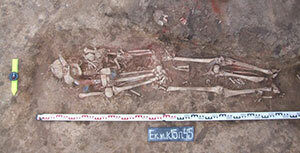 resurge of R1a-Z645 in Central-East European Bronze Age). Social, religious, or ethnic concepts may have changed in each of these episodes, along with the new prestige dialect. NOTE. A recent open access paper on two newly studied Middle Bronze Age inhumations from Stonehenge give an interesting idea of potential differences in social identities, in ancestry and geographic origin (which characterize ethnicity) may have been marked by differences in burial ceremonies: Lives before and after Stonehenge: An osteobiographical study of four prehistoric burials recently excavated from the Stonehenge World Heritage Site, by Mays et al. Journal of Archaeological Science: Reports (2018) 20:692-710. This must have happened then many times during the hundreds (or thousands in some cases) of years until the first attestation of a precise ancient language and culture (read e.g. about one of the latest branches to be attested, Balto-Slavic). Ancient language contacts, like substrates or toponymy, can only rarely be detected after so many changes, so their absence (or the lack of proper studies on them) is usually not relevant – and certainly not an argument – in scholarly discussions. Their presence, on the other hand, is a proof of such contacts. We have dozens of papers supporting Uralic dialectal substrate influence on Pre-Germanic, Proto-Balto-Slavic, and Pre- and Proto-Indo-Iranian (and even Proto-Celtic), as well as superstrate influence of Palaeo-Germanic (i.e. 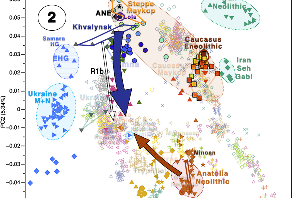 from Pre- to Proto-Germanic) and Proto-Balto-Slavic into Proto-Finno-Saamic, much stronger than the Indo-Iranian adstrate influence on Finno-Ugric (see the relative importance of each influence) which locates all these languages and their evolution to the north and west of the steppe (with Proto-Permic already separated, in North-East Europe, as is Proto-Ugric further east near the Urals), probably around the Baltic and Scandinavia after the expansion of Bell Beakers. These connections have been known in linguistics for decades. Apart from some early 20th century scholars, only a minority of Indo-Europeanists support nowadays an Indo-European (i.e. centum) substrate for Balto-Slavic, to keep alive an Indo-Slavonic group based on a hypothetical 19th century Satem group; so e.g. Holzer with his Temematic, and Kortlandt supporting him, also with some supposed Indo-European substrate with heavy non-Indo-European influence for Germanic and Balto-Slavic, that now (thanks mainly to the views of the Copenhagen group) have been linked to the Corded Ware culture, as it has become clear even to them that Bell Beakers expanded North-West Indo-European. NOTE. The Temematic etymologies have been (all of them) fully dismissed e.g. in Matasović (2013). I have already explained why an Indo-Slavonic group from Sredni Stog is not tenable, and genetics (showing Late PIE only from Yamna expansions) is proving that, too. Brought to you by the Copenhagen fantasy map series, Indo-Europeans after (no, really, after) the expansion of Yamna settlers in Hungary ca. 2700 BC: Yamna settlers have magically disappeared. Yamna-related Balkan EBA cultures and the hundreds of Yamna kurgans around the Lower Danube and in Hungary up to Saxony-Anhalt do not exist. Dat huge mythical Middle Dnieper territory lasting (unchanged) for a thousand years, in sooo close contact with Yamna territory (so beautifully ‘linked’ together that they must have been BFFs and admixed!). Uralic Mesolithic hunter-gatherers resisting IE invasions in Volosovo for 1,500 years like Asterix’ Gaulish village against the Romans. Tiny pockets of Bell Beakers will eventually emerge from (surprise!) Corded Ware territories beautifully scattered over Central and Northern Europe (unlike those eastern CWC mega-regions). And, of course, you can almost see Kroonen & Iversen’s Kurgan Pre-Germanic mixing already with their agricultural substrate TRB precisely in full-IE Denmark (quite appropriate for the Danish school). And sheep symbols representing wool finds, for no reason. A great map to mock for years to come, with each new genetic paper. and adds findings of wheels and wool probably in support of some new ideas based on yet another correlation = causation argument (that I cannot then properly criticize without access to its reasoning beyond cute SmartArt-like symbols) similar to their model – already becoming a classic example of wrong use of statistical methods – based on the infamously named Yamnaya ancestral component™, which is obviously still used here, too. The end result is thus similar to any other simplistic 1990s Gimbutas (or rather the recently radicalized IE Sredni Stog -> Corded Ware -> BBC version by the Danish workgroup) + 2000s R1a-map + 2010s Yamnaya ancestry™; but, hard to believe, it is published in mid-2018. A lot of hours of senseless effort, because after its publication it becomes ipso facto outdated. 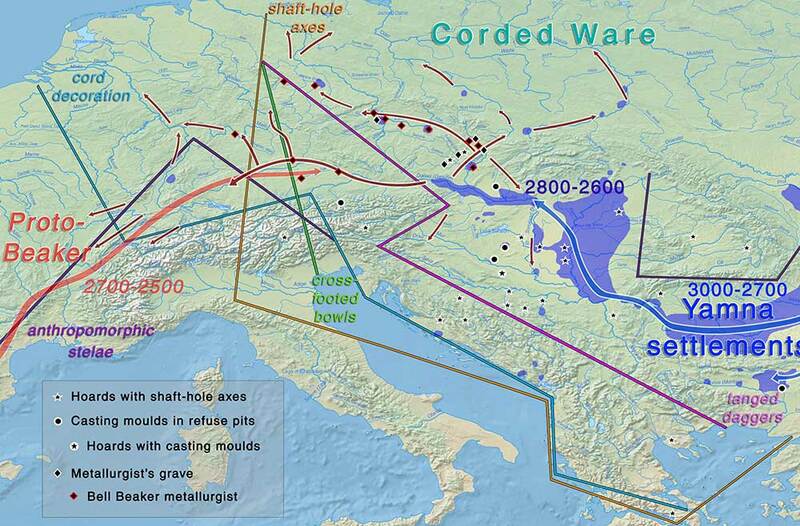 Cultural maps from Eneolithic and Chalcolithic cultures in Wang et al. (2018). The Lab is impressive. I would never dream of having something like this at our university. I am really jealous of that working environment. They are currently working on population transformations in Italy; I hope we can have at last Italic and Etruscan samples. It is always worth it to repeat that we are all the source of multiple admixture events, many of them quite recent; and I liked the Star Wars simile. 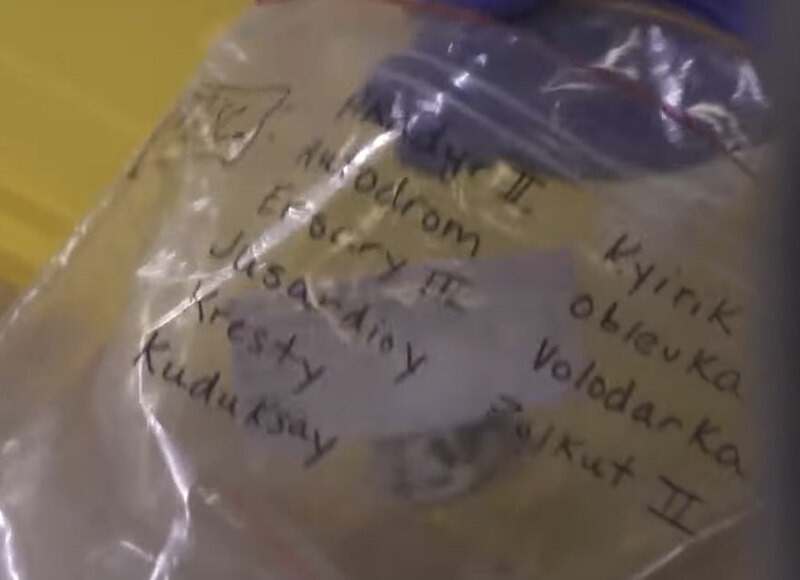 Also, some names hinting at potential new samples?? Zajo-I, Chanchan, Gurulde?, Володарка (Ukraine – medieval? ), Autodrom, Облевка, Кресты, Кудуксай (Ural region, palaeo-metal? ), Золкут, etc. On the bad aspect, they keep repeating the same “steppe ancestry” meme (in the featured image above, or the one below). I know this is the news report (i.e. science communication), not exactly the Reich Lab, but these maps didn’t appear out of the blue. Steppe ancestry distribution in Europe, according to PBS. 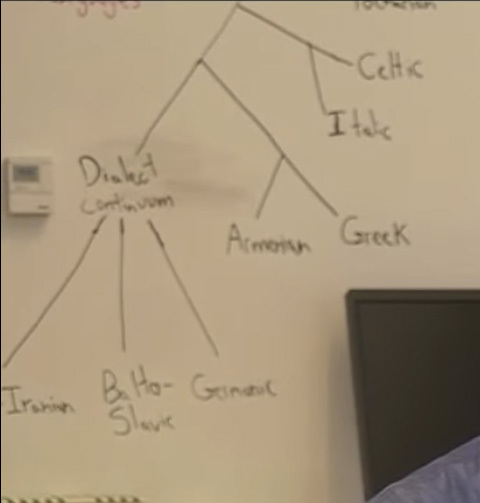 Whiteboard behind David Reich’s back (at his office?). It seems that while the Copenhagen group will still be bound (see here) by the Gimbutas/Kristiansen starting point, the Reich Lab will remain bound by Anthony’s selection of Ringe’s (2002) glottochronological model, and they will try to make genomic data fit in with it. I don’t know why university labs need to do this: To select the linguistic model preferred by a single archaeologist, which happens to be the lead archaeologist of the group, and then try to make genetic data agree again and again with that model. I guess it is a strategic question, and has to do with granting continued contacts with archaeological sites, and access to samples from them? I understand none of them will try to learn ancient languages, too much work probably. But, wouldn’t it have been more scientifish, at least, to depart from, say, three or four reasonable potential linguistic models (that is, from Indo-Europeanists), and from there discuss the best potential fits for the current genomic data in each paper? Yamnaya expansion coupled with Meid’s (1975) description of three stages of Proto-Indo-European development (as interpreted by Adrados 1998) and depiction of Heyd’s proposal of Yamna expansion. Wouldn’t you say it could have fitted the statistical and Y-DNA data seamlessly, in contrast to Gimbutas/Trager (i.e. Kristiansen today), or to Anthony/Ringe? NOTE. I would say the mainstream German school follows Meid’s (1975) three-stage theory coupled with Dunkel’s (e.g. 1997) nomenclature. The Spanish school follows Adrados, who has repeated ad nauseam that he was the first to mention the three-stage theory in conferences and papers previous to and coincident with Meid’s proposal (see his latest JIES article, a paper available in Scribd). In any case, Spanish and German scholars have been working hand in hand in accepting and developing a general linguistic model similar to the one above. Archaeological theories like those of Heyd or Mallory for Yamna and Bell Beaker (in contrast to Kristiansen or Anthony), and Prescott and Walderhaug for Bell Beaker and Germanic (contrasting with Kristiansen and Iversen) are compatible with this German/Spanish model. The French school is non-existent on the homeland matter, Italian scholars seem to be behind even in the description of Anatolian as archaic (probably related to the general wish to have Latin as derived from Vergil’s Troy), Russian scholars are still working with Nostratic and Mesolithic expansions, and Leiden, as the leading IE publisher worldwide today, is full of very different ‘divos’, each with his own pet theory (some obviously agreeing with the German/Spanish model; and especially interesting is that some of them are strong supporters of an Indo-Uralic proto-language). Thus, instead of comparing the main theories on Proto-Indo-European (i.e. linguistics->archaeology->genetics), which would have offered the most stable framework to assess potential prehistoric ethnolinguistic identifications, they keep using a single, simplistic language tree liked by an archaeologist, and trying to fit genetic data to it, while also adapting archaeology to genetics, i.e. genetics->archaeology->linguistics; which, as you can imagine, is not going to convince any linguist. Especially disappointing is that the world’s leading genetic lab still relies on a marginal proposal based on glottochronology, the homeopathy of linguistics… At least in that regard everyone should know better by now. Also, they keep interacting with the wrong audience: instead of trying to engage linguists into the real homeland and dialectal quest, to keep Genomics a serious discipline among academics, they tend to discuss with politically- or racially-motivated people, which is probably also in line with strategic decisions. In the example below, we see the main author of their recent paper on Indo-Iranian migrations seeking once again interaction, this time through “news” promoted by Hindu nationalist bigots, so that – even if that makes them look more neutral in the eyes of those who may allow access to Indian samples – , in the end, we see in genomics a fictitious revival of the “AIT vs. OIT debate” dead long ago in linguistics and archaeology (anywhere but in India). Pretty disappointing to see these trends; so much effort and time invested in futile discussions and infinitely reworked doomed glottochronological or 19th-century models, when it is the fine-scale population structure of expanding Yamna peoples what we should be discussing now, and thus Late PIE dialectalisation with offshoots Afanasevo, East Bell Beaker, Balkan Bronze Age, and Sintashta/Potapovka; as well as Corded Ware evolution in Uralic-speaking territory. EDIT (7 JUN 2018): Some parts of the text have been corrected or slightly modified.